Photographers who witnessed actor Alec Baldwin's outburst outside the city's Marriage Bureau on Tuesday are offering investigators different accounts of whether Baldwin actually threw a punch, sources tell NBC 4 New York. If the actor did strike Marcus Santos, a photographer for the Daily News, he could be charged with assault, sources say. Sources say the Manhattan district attorney has requested Santos' medical records. But a second photographer, Jefferson Siegel, told detectives he did not see Baldwin punch anyone, sources say. Alan Abraham, Baldwin's attorney, said he'd make the actor available to the DA if requested. Police have located video of the incident and are reviewing it, sources said. Investigators also found a fingerprint on one of the camera lenses that Baldwin allegedly came into contact with, and have sent it to a lab for analysis. The New York Press Club released a statement late Wednesday protesting Baldwin's alleged outburst. "Baldwin is a public figure," the statement said. "His activities -- including in this case, the procurement of a marriage license -- are legitimate subjects of media interest." Hours after the scuffle, an apparently still-angry Baldwin tweeted "I suppose if the offending paparazzi was wearing a hoodie and I shot him, it would all blow over..."
The dispute erupted early Tuesday when the actor walked out of the marriage office with his fiancee, Hilaria Thomas, and was met by photographers. "He was looking mad," Santos said. "He said, 'Step back, step back.' I said, 'We're moving back." Baldwin then allegedly grabbed Siegel, and Santos told the star not to touch him, according to the newspaper's account. "I knew he was going to attack me," Santos said. "I stepped back, and he kept coming. He comes after me, starts shoving and punching me -- one time, right in the chin. And then he started shoving me and pushing me. Then he goes the other way." Santos filed a complaint against Baldwin, claiming the actor threatened to punch his teeth out. The photographer says Baldwin then punched him on the right side of his face, and says his jaw is sore because of it, sources told NBC 4 New York. Baldwin's spokesman Matthew Hiltzik had a different account of what happened. He said in a statement that a photographer "aggressively trying to shoot the couple" became angry when a passerby interfered with his shot. "The photographer was clearly frustrated, pushed past the bystander and assaulted Alec with his camera," Hiltzik said. "There were no punches thrown, and any subsequent physical contact was simply Alec protecting himself." 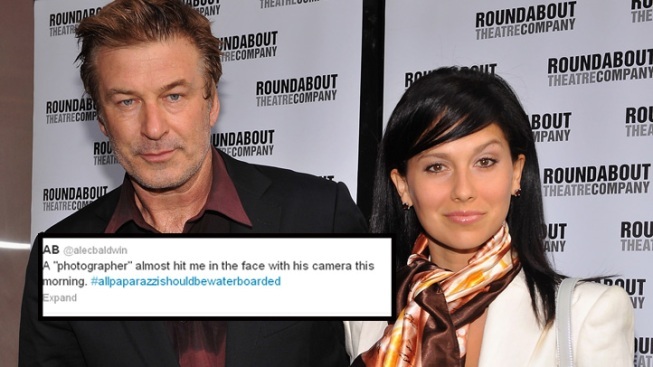 For his part, Baldwin tweeted that "a 'photographer' almost hit me in the face with his camera this morning. #allpaparazzishouldbewaterboarded."